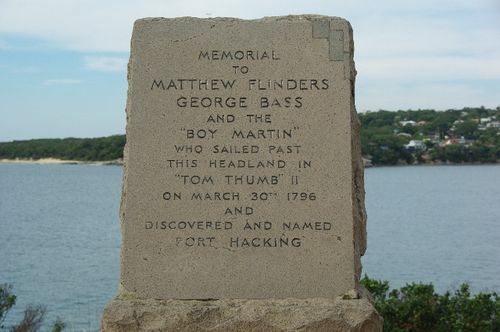 A monument commemorates explorers George Bass, Matthew Flinders and the boy William Martin. Matthew Flinders and George Bass explored and mapped the coastline and Port Hacking estuary in 1796 and the southernmost point of Cronulla is named Bass and Flinders Point in their honour. Matthew Flinders undertook his first voyage of discovery with George Bass, with whom he had struck up a friendship on the way to Australia on the Reliance in 1795. At this time Bass was 24 and Flinders 21. They sailed out of Sydney Heads in the Tom Thumb, a boat of (keel) length 2.5 metres, only one month after their arrival in Sydney. Along with Bass' general assistant (or servant), the boy William Martin, they reached Botany Bay and managed to travel 32 kilometres further upstream along the Georges River than any previous explorer . Martin also travelled with Bass and Flinders on the second Tom Thumb expedition to Lake Illawarra, and seems to have been a competent sailor. He is the youngest explorer of Australia's early colonial history.